This score sheet became necessary to hold my students accountable to their behavior whether they were in homeroom with me, or with a different teacher for reteach and enrich, specialty rotations like: art, physical education, computers, keyboarding, coding, library...etc, or if there was simply a visitor in our classroom. Sadly, a handful of my students needed to know that the expectation needed to be met, whether I was in the room or not. Most importantly, my students that continually strive to meet the expectation needed the opportunity to be celebrated. 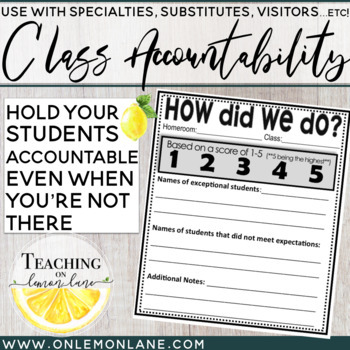 I use these score cards as a way to communicate with my students specialty teachers and to hold my students accountable for their time when they are not with me. These score cards are easy to use, allow for both positive and negative consequences, and a place for additional notes. They are a simple and effective way to reinforce your classroom management strategies. More than anything my students non-homeroom teachers could not appreciate them more. By better communicating and implying this simple strategy, behavior, and attitude improved exponentially for my students! Let me know if you have any questions on how to use these, or if you have other suggestions as to how you applied them in your classroom! I love your feedback! ***Make sure to follow my store; Teaching on Lemon Lane, to stay up to date on the latest products, sales and FREEBIES! As always I LOVE to hear from you! Just launched an Instagram and Facebook account and in the process of launching www.onlemonlane.com! If you enjoyed this product you will love the EXCLUSIVE member-only content available in the digital resource library at On Lemon Lane. Subscription is FREE and easy-peasy, Lemon squeezy!